We cultivate 30 acres of apples, growing nearly thirty varieties. 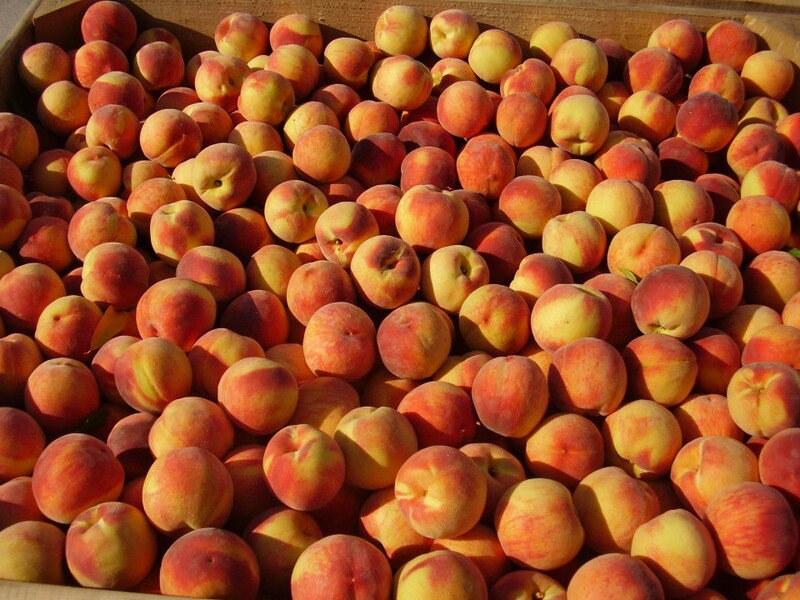 The 70 acres we devote to peaches produces 17 peach varieties and eight kinds of nectarines! 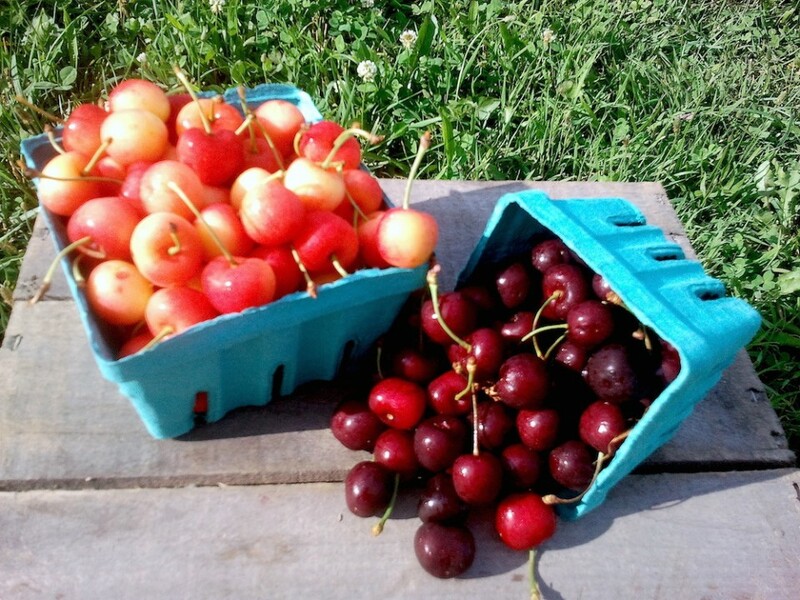 We also produce a variety of berries, cherries, grapes and more. We grow a wide variety of apples from late summer through the end of October. We’re sure you’ll find your favorite, whether sweet or tart. Interested in a larger quantity for sauce or storage? 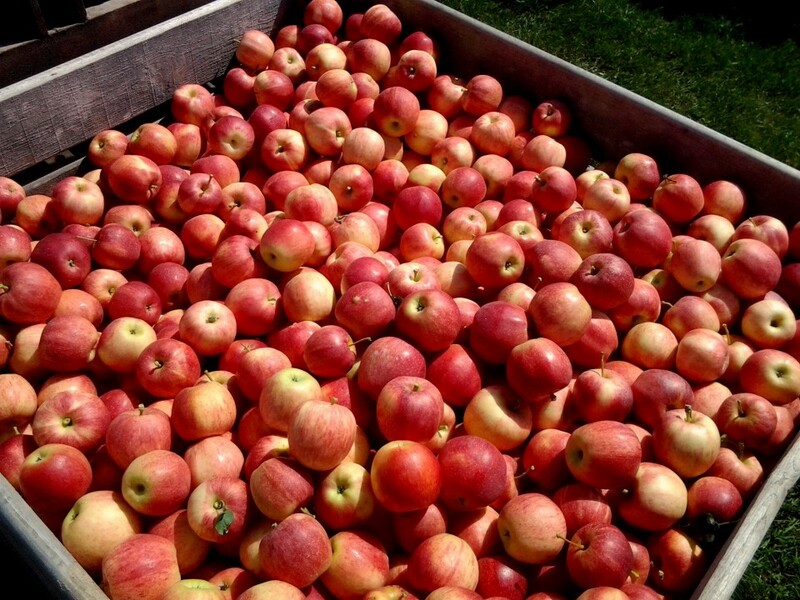 We sell apples by the half bushel at a discounted rate. Call us up or shoot us an email, and we’ll have them ready for you to pick up at the next market! The varieties below are listed in approximate order of ripening. Yellow Transparent Early yellow antique variety first grown in Russia. Tart flesh. Excellent for sauce! Lodi Early season green apple. Tender, acid and juicy. Excellent for applesauce. Tydeman’s Red Thin red skin and flesh that is mild, with a perfume-like sweetness of Cotton Candy. Summer Mac (a.k.a. Paula Red) Late summer Mac variety. Solid red skin over creamy white, tart flesh. Pristine Early yellow apple developed at Purdue University Sweetest apple in the early season. Zestar! Crisp and juicy. Excellent sweet tart flavor for eating & cooking. From University of Minnesota. Sansa Sweet early apple with bright red stripes over yellow skin. Best for fresh snacking. Ginger Gold Outstanding early season eating variety with yellow skin. Sweet, juicy and firm. Summer Rambo First grown in 16th century France. Green skin with red stripes, crisp, mild tartness. Gala Very sweet with orange-striped skin and yellow flesh. A new favorite for snacks and salads. MacIntosh Juicy and slightly tart. Great for baking. Jonamac Cross between Jonathan and a Mac. Tart, rounded taste. Pale flesh is firm and crisp. Blondee Early sweet-tart yellow apple with clear smooth skin discovered in Ohio in 1998. Smokehouse Antique Pennsylvania Dutch green apple. Excellent for pies, cooking and sauce. Elstar Developed in the Netherlands in the 1950s. Crisp, tart, cream-colored flesh. Honeycrisp Crisp, juicy, sweet flavor. Developed by U. of Minnesota. Consistently rated #1 in taste tests. Jonathan Moderately tart red apple. Delicious for snacking, salads and cooking and fried apples! Daybreak Fuji An early sport of Fuji discovered on our neighbor’s farm. Sweet and juicy. Crimson Crisp Bright red skin over yellow flesh. Very, very crisp with a rich sweet/sharp spicy flavor. Pink Pearl Unique pink-fleshed apple with translucent green skin. Crisp, tart flesh that is high in antioxidants. Shizuka Sweet and juicy, firm texture and crisp flesh. Excellent for snacking or cooking. Snowsweet Pink red skin with sweet, very white flesh that is extremely resistant to browning. Crimson Gold Red yellow bi-color skin. Juicy, fine texture flesh with a sweet-acid balance. Great for snacking! Cortland Mildly tart. Popular variety for sauce, pies, and whole baked apples. Ambrosia From British Columbia. A good snacking apple with crisp texture and juicy aromatic flesh. Northern Spy The consummate pie apple. Sprouted from a seed in New York in 1800. Crimson Topaz Developed in the Czech Republic. Crisp cream-colored juicy flesh with a tart punch! Candycrisp Glossy yellow conical apple with extremely mild, somewhat pear-like flavor. Stayman Firm, rich flavor and mildly tart. Great all-purpose apple. Winesap An American heirloom apple dating back to the 18th century. Tart – good for cooking or eating fresh. Nittany Introduced by Penn State Univ. Sweet-tart and spicy flavor with red-orange skin. Suncrisp A cross of Golden Del. and Cox Orange Pippin. Golden fruit with sweet-tart intense spicy flavor. Braeburn Red and green skin. One of the firmest apples available. Very crisp with tart-sweet flavor. Fuji Very firm and unusually sweet. Striped red and yellow. First discovered in Japan. Granny Smith The famous green apple. Very firm and tart. Good for all cooking purposes. Pink Lady Attractive pink blush. Crisp fruit with a sweet-tart flavor, and a long storage life. Goldrush Best apple in storage into new year. Extremely firm and tart. Chewy gold skin with russet. In Latin, the apricot’s name means “precious,” a label earned because it ripens earlier than other summer fruits. China deserves the credit for discovering and cultivating this richly sweet fruit over 4,000 years ago. Hundreds of centuries later, Spanish missionaries carried apricots to North America. A relative of the peach, the apricot is smaller and has a smooth, oval pit that falls out easily when the fruit is halved. The May 2011 edition of the Washingtonian Magazine named our “juicy, flavorful apricots that arrive mid-summer” as one of the things that they crave most! Early Blush A new early variety. Medium size with orange-red blush over a golden background. Goldrich Bright, shiny orange color freestone fruit. Flesh is firm, fine textured and deep orange. We affectionately refer to these as “Baby Rattles” because you can hear the pit shaking inside the fruit. Our favorite Apricot! Goldcot Medium-size nearly round fruit. Golden moderately think skin. Flesh is farm and medium orange. Harcot Medium to large fruit with sweet, juicy rich flavor. Originally developed in Canada. Orangered Fruit has a red blush over a bright orange background. Firm texture and high quality flavor. Harlayne Bright yellow medium size freestone fruit with yellow blush. Hargrande Very large fruit, yellow-orange in color. Flesh is firm, orange and freestone. Sugar Pearls A very new exciting white fleshed apricot! Very sweet, with a flavor similar to a white peach. Not something you can expect to get anywhere else! Chandler Originally a California variety which has proven to be well-suited to conditions on the East Coast. These large, full flavored berries grow on raised beds and produce fruit over a 4-5 week season. Flavorfest A new disease-resistant June-bearing variety that was bred right here in the Mid-Atlantic. We’re looking forward to tasting some of these medium-sized super-sweet berries. Seascape Strawberries in October? It’s true! 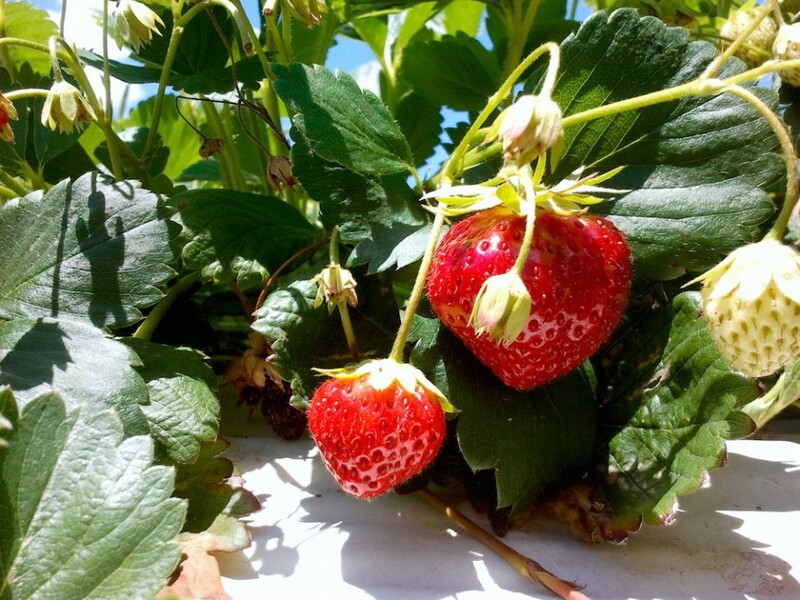 Unlike the traditional June-bearing strawberries, these berries will fruit from July until the first frost in October. Arapaho A medium fruit, not seedy, and sweet with an excellent flavor. Triple Crown A medium to large fruit, not seedy, and very sweet and flavorful. Chester A large fruit that stores well. Siskiyou We grow this early-season variety in our high tunnel. 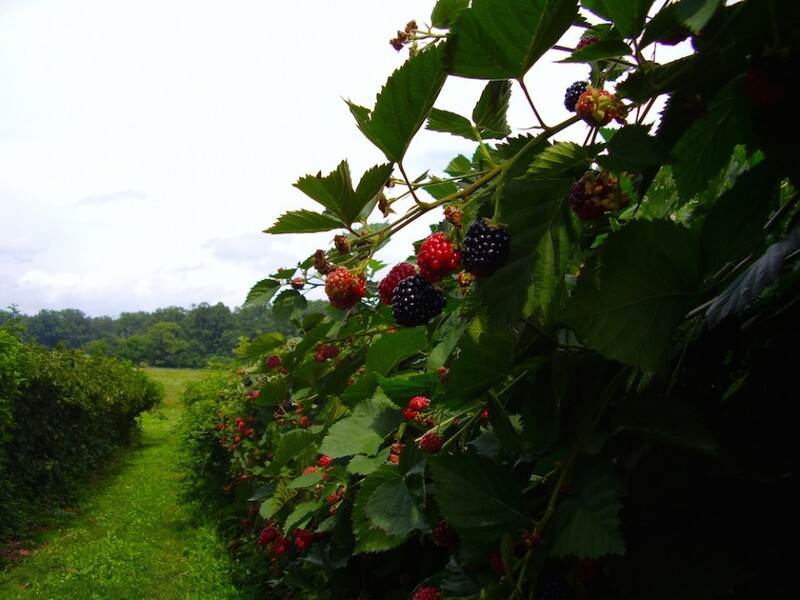 Prime-Ark 45 This fall-bearing variety produces fruit until the first frost, extending our berry-growing season! Prime-Ark Freedom Another fall-bearing variety that brings us fruit until the first frost. The raspberry is composed of many connecting droplets— individual sections of fruit, each with its own seed—surrounding a central core. This makes them very fragile. 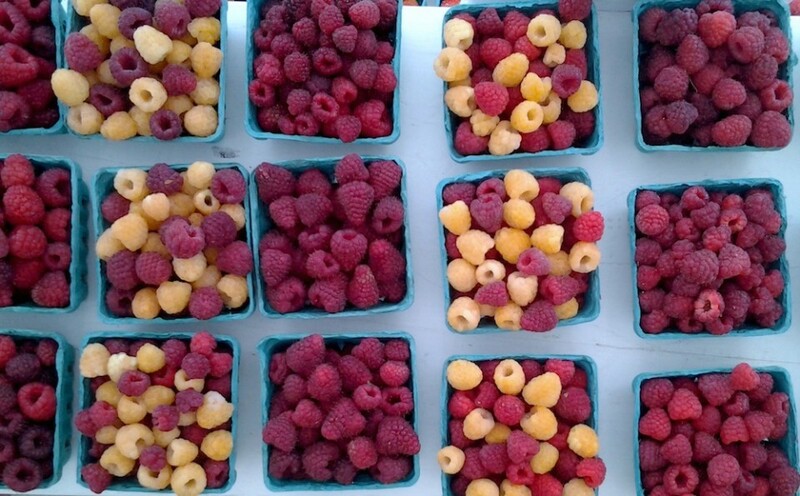 We grow summer- and fall-producing red raspberries that are as fresh from the vine as you can get! Caroline, Encore, Prelude, Himbo-Top & Nova Classic red raspberries. Anne A fall-bearing gold raspberry. Jewel Our favorite black raspberry! A glossy black fruit, large size and a rich, true raspberry flavor. Blueberries are perfect for tossing into cakes, muffins, cereal bowls and fruit salads. Like other berries, they also make good preserves and tarts. Bluecrop, Chandler, Patriot, Spartan, Duke, and Aurora and Elliott to help extend the season. Chandler is our favorite–these blueberries often grow to the size of quarters! These large, tart, translucent green or red berries in the Ribes family are round and about half an inch in diameter. They’re very acidic and pair well with roasted meats, like goose, and mix well in jam, pies or other desserts. Another member of the tart Ribes family. The small fruit with translucent skin is harvested in clusters. Admired for generations in Europe for their versatility, these fruits make refreshing juice and wines and excellent jam and provide more Vitamin C than fresh oranges. We grow a wide array of red, white, pink champagne and black varieties. We grow many varieties of seedless table grapes with an array of colors from pink to blue to black to green to amber. The beautiful clusters of these succulent seedless grapes are almost impossible not to munch on. The flavor of our grapes will blow you away – forget about ever buying another bunch from the supermarket! Our favorite varieties include Jupiter, Neptune, Vanessa and Einset. We also grow several varieties of the slip-skin type of grape. If you hold one of these grapes between your thumb and forefinger, you can pop or slip off the skin of the grape. These grapes are sweet with a “foxy” flavor and can be eaten fresh (minus the skin) or used for making jelly, juice and wine. Concord is the most popular variety with dark purple-blue fruit with a bluish bloom. Niagara has green fruit that is the source of most white grape juice. A new berry adventure for us! Haskaps are an edible honeysuckle that originate from Siberia and can be also found in Russia, China and Japan. The elongated blue berries are the first berries we pick in the spring – a couple weeks prior to strawberries. 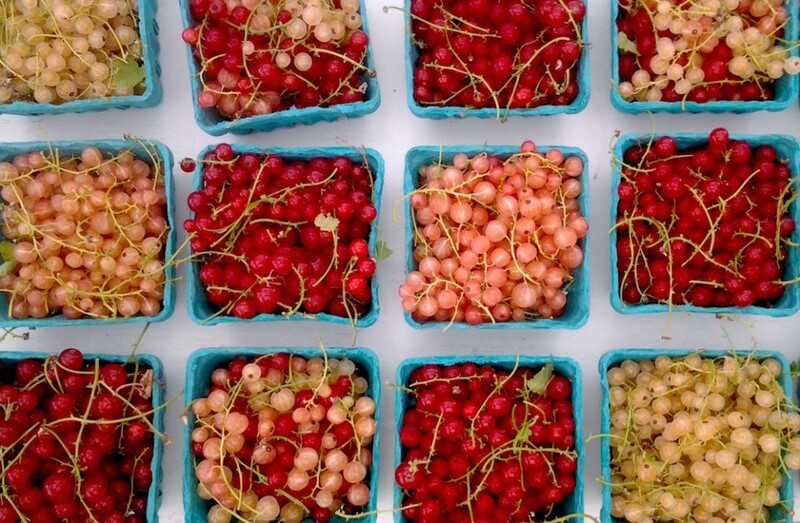 Haskaps are unlike any other fruit you’ve tried. Although some have compared their taste to blueberries, raspberries, blackberries, rhubarb and black currants, they are most often compared with blueberries minus the seeds. They actually do have seeds, but these are similar to kiwis’, so you don’t even notice them. As for uses, basically anything you would do with blueberries, you could also do with haskaps – eat them fresh, use them in baking, use them for jams & jellies, etc. Summit An early variety with large, heart-shaped cherry fruit with good flavor. Ulster Dark red, large, firm-fleshed, sweet fruit ripening mid-season. Lapins Developed in British Colombia, this unique dark red cherry is large in size, and has good flavor. Black Gold A dark red cherry with firm fruit and good size. Hedelfingen A large, firm-fleshed, high quality late dark red cherry. Hudson The latest of the good dark, black sweet cherries. Emperor Francis A large, high quality yellow cherry with red blush. Schmidt Biggareau A dark red sweet cherry ripening in the mid-season. Regina A late ripening, dark red sweet cherry. The fruit is very firm and large. Also known as Sour Cherries or Pie Cherries. These cherries are quite tart (hence the name) and are best known as the key ingredient in desserts such as cherry pie or cherries jubilee. They are also delicious in main courses, salads, jams and jellies, dried and beverages. 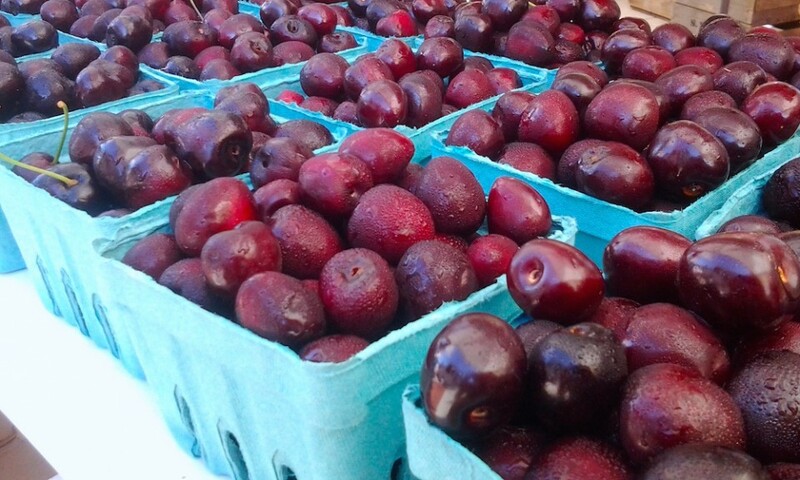 Tart cherries are seldom sold fresh in your local grocery store and have a very short season, so get them when you can at market! Jubileum A very early variety with dark red fruit and good storage qualities. We often pick these up to a week or more before the other varieties! Danube Very dark red fruit that is very sweet (for a tart cherry). Planted widely in Europe. Balaton A Hungarian cultivar introduced in 1984 with very firm dark red fruit, red juicy flesh. Great for drying. Montmorency The traditional tart cherry. Medium-sized with a bright red fruit and clear, juicy flesh. Nectarines, whose name comes from the Greek “nekter” for sweet liquid, are a fruit all their own, not a cross between a peach and a plum, or a fuzzless peach. Like peaches, nectarines may be yellow or white-fleshed and clingstone or freestone. A yellow nectarine’s flavor is similar to a peach, only richer. Avalon Very early season yellow variety with rich color and balanced good flavor. Developed at Rutgers Univ. Easternglo Medium to large yellow mostly freestone. Fruit is firm, nearly 100% red, with a smooth finish. Nectafest A new high quality yellow flesh fruit with a good flavor profile. Developed at USDA research station. Summer Beaut Exceptional yellow fleshed freestone. This early season variety has medium size. Sunglo A large, very red freestone yellow nectarine with drier flesh with good flavor. Redgold A high quality late yellow nectarine. Fruit is freestone, with excellent color and flavor. Fantasia Excellent quality, yellow fleshed, free-stone nectarine. Fruit is large with a smooth glossy finish. Ambre A very late season freestone yellow variety developed in France. Sweeter than many yellow varieties. Jade Early season freestone white nectarine with very firm sweet flesh. SilverGem Medium-sized white nectarine with a pleasant balance of sugars and acid. Arctic Jay Mid-season white variety. The flesh is very firm and has a sub-acid sweet flavor. Arctic Pride White flesh clingstone nectarine. Moderate firmness and mid-sweet flavor. Arctic Star Medium-sized clingstone white variety with a sweet sub-acid flavor. Flesh is white with some red. Arctic Sweet One of the best-flavored white nectarines. Fruit is medium size, firm and highly colored. Zephyr Very large freestone white nectarine with excellent flavor. Emeraude Large, highly colored white variety with very good sweet flesh. Developed in France. Our customers often tell us that our peaches are what draw them to our farmers markets. You just can’t find a good ripe peach in the grocery store! We bring our peaches to market freshly-picked and tree-ripe. Rich May Our earliest ripening peach. Outstanding red skin, clingstone with firm flesh and good flavor. Flaming Fury Clingstone with semi-firm flesh and fair flavor. Desiree Semi-Freestone peach developed at Rutgers University. Juicy flesh with slightly sweetness acidic flavor. Glenglo Medium to large semi-freestone peach with good flavor. Sentry A firm, highly-colored, semi-freestone peach with excellent size for an early season variety. Redhaven Standard for the NE peach industry. Fruit is medium-size and colors to a brilliant red. John Boy Developed from Loring. High quality fruit with good color. One of our new favorites! Bellaire A mostly freestone variety with a very classy attractive coloring. Bounty Very large fruit that is firm and freestone. The best peach for canning! Cresthaven A very firm, highly colored mid-season variety. Yellow flesh shows red around the pit. Autumnglo A large late season variety with dark red blush and excellent flavor. Encore A very attractive late season peach with large firm fruit. Laurol A late season peach with large, attractive red skin fruit and firm yellow flesh. Victoria Large with firmer flesh and excellent flavor for a late season peach. Ouchita Gold A very late season variety. Medium fruit with attractive orange-red color on yellow. White peaches have white flesh and less acid than yellow-fleshed peaches, so they have a higher sugar content and taste “sweeter.” Some of our white peaches are freestone, with the flesh easily separating from the stone or pit, and some are clingstone, meaning the flesh clings to the pit. SpringSnow Medium clingstone fruit with semi-firm very sweet flesh. Sugar May One of the best in the early season. Medium in size, highly colored, firm flesh and clingstone. Snowbrite Large fruit that is typically freestone developed in California. White creamy sweet flesh! White Lady The fruit is highly colored and very firm with excellent dessert qualities. A sub-acid variety. Klondike Medium to large fruit is firm and very attractive. Sugar Giant One of the largest white fleshed sub-acid peach varieties. Exceptional color and firmness. August Rose Late season white peach developed at Rutgers Univ. Freestone with delicious flesh. Snow Giant Very large late season freestone peach with very good flavored sweet flesh. Although these peaches are a recent phenomenon in the fruit industry, scientists believe that peaches growing in the wild originally had this flat shape! We only grow one variety, Saturn. Their delicate white flesh, flat shape and exquisite sweet flavor with a high sugar content are quite appealing. We currently grow several of the well-known varieties, as well as sweet, crunchy, amazingly juicy Asian Pears (also known as “apple pears”). 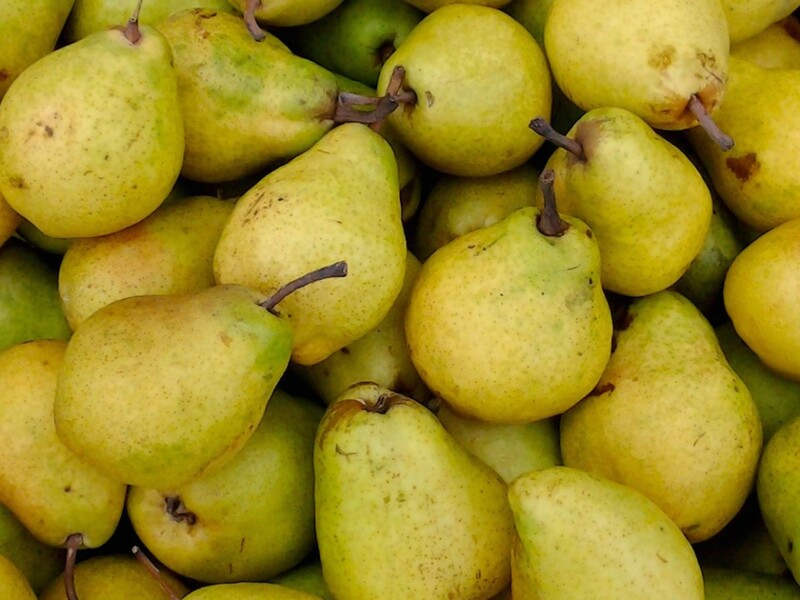 European Pears are what most folks think of as traditional pears. They soften as they ripen and have a traditional pear shape. After many years of growing only the two traditional varieties, Bartlett and Bosc, we’re excited to finally offer a wider selection of pears, many of which are more disease resistant, store well and are better tasting! Sunrise Yellow, often finishing with a slight blush and very little russet. Flavor is very pleasant and sweet for the early season. Bartlett A good all-purpose pear that is sweet and juicy with a smooth texture. The green skin turns yellow when ripe. Great for canning or eating fresh. Blake’s Pride Medium size fruit with an attractive yellow color and excellent, aromatic flavor. Harrow Sweet A late season pear developed in Ontario. Yellow skin with an attractive blush. Flesh is juicy and sweet. Magness Skin is greenish-brown, covered with light russet. Flesh is soft, juicy and almost free of grit cells. Flavor is sweet and of excellent quality. Bosc A large russeted pear with white flesh and a rich, delicious flavor. Great for poaching! Beurre D’Anjou A fine-textured pear, the flesh is mild and aromatic. Skin remains light green and flesh stays fairly firm even when ripe. Stores well. Shenandoah Very late season pear that stores well. Fruit size is large with traditional sub-acid pear flavor. Shinseiki Early season variety with yellow finish and little russet. The fruit is crisp and juicy. Hosui Ripening in late August, the fruit is mildly flavored, sweet and juicy with solid russeted skin. Yoinashi Fruit is large, orange-brown with a russeted finish and crisp, richly aromatic, firm flesh. Olympic Round, large, heavily russeted brown pear has a crisp, juicy sweet taste. Stores well. Quince are a relative of pears and apples with hard, strongly-perfumed flesh. Too astringent and sour to eat raw, quince make excellent jam. They may also be peeled, then roasted, baked, stewed into a sauce or poached. The flesh often turns red after a long cooking time. Methley A small early plum with purple red skin, and sweet flesh that is very juicy. Early Golden A small early plum with red blush over golden yellow background. Fruit is very sweet. Shiro A sweet, juicy yellow plum. Fruits are round, clingstone, and medium to large in size. Santa Rosa A large, attractive, dark reddish purple plum with red flesh. The fruit is quite firm. Ruby Queen With an outstanding flavor, the fruit has reddish-black skin with a firm, red flesh. Satsuma A distinctive, dark red plum with red flesh. Fruit is oval shaped and very sweet. Duarte Very large blood red heart shaped fruit with red flesh. Excellent flavor, Good for eating fresh or for jams. Friar Large oval plum, black with light amber flesh. Freestone with a small pit. Sweet and juicy. Fortune Late season plum. Fruit is large, reddish-purple and very firm with yellow flesh. Our favorite! European Plums are small oblong fruits, most often with a blue skin and yellow, juicy, fine-grained flesh. Although mainly used for cooking and making prunes, European plums can be eaten fresh and many people enjoy eating them this way. Castleton Early Early maturing variety with slightly ovate blue fruit. Green Gage Considered to be the ideal dessert plum in Europe. Green fruit with red mottling. Stanley Fruit is large, with dark blue skin and flesh that is greenish-yellow, juicy and fine grained. Long John Dark blue, very large fruit of high quality. "My kids are calling the Fuji apples 'candy apples' because they taste as good as candy!! We are going through them at record speed!" "Your fruit really is the best. Best peaches and apples, love the blueberries."